This set contains EDITABLE calendars for the 2017-2018 school year (August 2017-July 2018) AND templates for future years! Each calendar has editable behavior codes, a place to enter your e-mail address, and label the day if needed. The calendars are in color, black and white, and with regular font. The calendars show Monday-Friday only so it does not confuse the students with weekends. 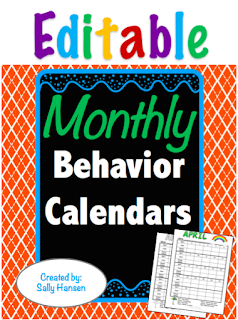 The behavior calendar provides daily behavior documentation and opens communication with parents. I have my students color in the behavior earned for the day in the square at the end of the day. ✓ Editable PPT Calendar Templates for Future Years! Clip art (theme for each month) and tables cannot be edited.